We finally settled into a good fall routine. My oldest daughter is thriving at school, my middle two are loving homeschool (and so am I! ), and my baby is a happy little guy. I’m even cooking dinner six nights a week with the help of my crockpot. 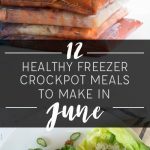 I like to set aside an hour on Sunday to make 5-10 crockpot freezer meals at a time. The meals don’t require any cooking before freezing, so they’re very easy and quick to prep. Simply combine the meat, veggies, sauces in spices in freezer bags and freeze for later. Then all I have to do is dump a bag and go about my business until my house smells amazing. 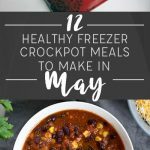 Since this is such a busy time of year, I decided to make a list of our favorite crockpot recipes that are super easy to make. Things like chicken breasts plus a bottle of BBQ sauce and a jar of peach jam, but way healthier. And more delicious. Here are our 31 easy and healthy favorites. Friends, most of them are made with 10 ingredients or less. Dig in! Oh, and I’ve been getting a lot of questions about chicken drying out in the crockpot. I only cook chicken breasts for 3-4 hours in my favorite 6-quart crockpot. It has a programmable timer so I set it in the morning and let it switch to warm when it’s done cooking. It sits on warm for hours, but that doesn’t seem to make a difference. Works perfectly. Questions or comments? Leave a comment below and I’ll respond ASAP. I’d love to hear from you. Thank you SO MUCH for this compilation and the PDF. This is exactly what I’ve been looking for- easy meals that I can make ahead and fit into our real food lifestyle. I’m looking forward to exploring the rest of your site! I bought this cookbook but I can’t find it on my iPad. Where do I find it? Hi Kathleen! All of the eCookbooks are delivered via email for instant download. I went ahead and sent you new copies. Thank you for your purchase and I apologize for any confusion! I just found this today and I must say…THANK YOU. Thank you for making this list of recipes WITH the shopping list to go with it. You have made this so super easy. I can’t wait to explore more of your site and see all the helpful suggestions and links you share. Looking forward to so much more. Thank you. Tonya, I’m so glad that you found us! I’m expecting baby #2 & want to tackle some freezer meals to prep. How long do you think it would take to make all 31 meals? I’m going to set aside an entire day/afternoon this coming Sunday…with one helper (my mom). Am I biting off more than I can chew? I just thought it would be easier shopping from the pre-prepped list you shared rather than writing separate grocery shopping lists for ala carte recipes. Any thoughts would be much appreciated!